Being an actor must be exciting. Being the main actor of a massive West End production like the Disney’s Aladdin must be exciting and a lot of fun, too. And you can see the excitement in Matthew’s face when he performs every night at Prince Edward Theatre. 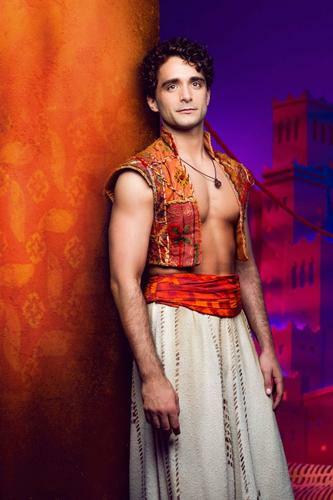 I think that if Aladdin is such a great show, it is also because Matthew makes it special. - It has been few months since you started to be the leading man of the Disney’s Aladdin. How is your experience going so far? I can’t compare it to anything I’ve done before as it’s a whole new level. I absolutely love it and to this day I’m still pinching myself about the fact I’m Aladdin. I’m having the best time. - Why do you think Aladdin and Lion King are such big and famous shows in London? Well the films were so successful that I think at first the public were so happy to see their favourite Disney films come to life and I think after that the shows continue to wow audiences because they are such a spectacle and done to the highest standard. - What do you think about the theatre scene in London? Do you have time to go to see shows? And if yes, which one was the last you have seen? I don’t get to see many shows in London as I’m performing at the same time as everyone else but I recently took some time off to go on holiday to New York and I saw 5 shows in 5 days and was amazed by them all. Although I think ‘Dear Evan Hansen’ was my all round favourite. - There is space for any other dreams in your drawer? My dream for such a long time was to be a leading man and even then it didn’t have to be in the West End ,I just wanted to play a part of my own where ever that may have been. So to say now I’m playing Aladdin in the West End is just a huge dream I wasn’t sure would even happen so it’s difficult to say. But as I mentioned I have just been to New York so I would say Id love to perform on Broadway one day.